This last week I have been suffering from an awful virus. So have not been cooking much or doing any other work for that matter, except being over active on-line, if that can be counted as work. Have not been able to eat much either. I never thought I can ever get off food, but this virus made that impossibility a possibility! In my view the only good thing about this whole boring business of being sick! After suffering my snuffles and groans for the whole week, last evening my husband decided to take charge. Now when my extremely easy going husband goes into his 'I am the boss here and you better listen to me' mode he can be pretty intimidating. After ordering me to get comfy on the couch (where I happily watched the movie 'Under the Tuscan Sun'), he put on his apron and marched into the kitchen. 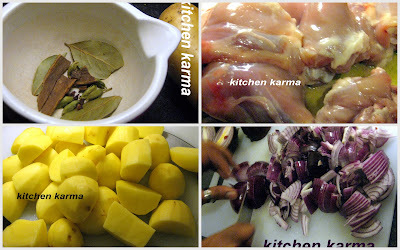 He was on war path err he was going to make his special murgir jhol/chicken curry. His way of dealing a deadly death blow to this itinerant virus bugging me. I know we Bongs are reputed to love our maach bhat/fish curry and rice, but there is something special the way chicken curry touches the weary soul. So chicken curry is a firm favourite with all ailing Bongs, be it the physically sick, the heart broken or just the plain tired and exhausted and needing home nourishment types. And the good news is even the hale and hearty enjoy it! I cannot resist adding a bit of chicken history here. No, not the chicken-or-egg saga. This is just a bit of social history. Chicken was never allowed into Bengali households till the 1970s. My grandfather used to call it nishidho pokhhi/ the banned bird. Though restaurants severed it (mostly Indo Chinese and Anglo Indian ones), chicken did not even have a place on mighty Bengali wedding menus. If there was some kind of horrible sickness in home and the doctor prescribed chicken broth, the meat was not allowed inside the house. Mostly it was cooked in outhouses by servants and other family members never even dreamed of trying it. But around 1970s and 80s matriarchs started waking up to the goodness of chicken and more and more households started cooking it. Considering its late start, the humble chicken made rapid strides in securing a firm foothold in Bong hearts. Today it is uniquely popular, because it is almost as regular as our fish yet almost as special as our mutton. Of course we cook chicken in many ways, but murgir jhol or chicken curry has acquired a cult status among our home cooked fares. We Bongs cook our chicken curry with potatoes which we believe add body to the gravy. We are every bit as serious about those potatoes as the chicken. Almost every Bengali household has their own recipe for this. The recipe I am sharing today is how my husband makes it. If you want another recipe my friend made one to deal with her cold. You can find her recipe here in her food blog Presented By P.
In a large pan, add the oil, when the oil is hot and fuming, add the whole garam masalas and the onion, fry the onion till light brown, add the turmeric and red chilly powder, once the masalas are fried, add the ginger and garlic paste and fry them too. Then add the salt and the sugar and cook for a minute or two before adding the chicken pieces. Fry the chicken pieces for 5 minutes or so, before adding about 2 to 3 cups of water so that all the chicken pieces are submerged in the water. Cover and let it come to a boil. Once it comes to a boil, reduce the flame to very low, in a pressure cooker put the potato chunks and take about half of the gravy in which chicken pieces were boiling and add to the pressure cooker. Put the lid and whistle on and cook till the required number of whistles to boil the potatoes. This varies from pressure cooker to pressure cooker and also the kind of potatoes used. Here we cook till three whistles of the pressure cooker. While the potatoes are cooking, let the chicken cook in the pan on very low flame, add some water, it if gets too dry, cover and leave it alone, of course checking occasionally. Once the pressure cooker has cooled down, add the potatoes and the gravy to the pan where the chicken is shimmering. After mixing well, leave it to cook for 5/6 minutes more and your chicken curry is ready. The trick in this curry is cooking the potato pieces in chicken gravy. Also since the chicken is left to bubble in the gravy for about 20 to 30 minutes while the potatoes are cooking the gravy becomes super infused with chicken-y flavours. Both of this makes the curry super delicious. Once the curry is ready, serve it hot with some steamed rice and after a plate of this you will be ready to take on the world. Simply mouthwatering jhol with pieces of both potato and chicken. Dekhe jibe jol eshe gache! super tempting curry..looks so inviting!! Very delicious n tempting curry..
Thanx for dropping by my space n hope u'll visit again,join me back too!! Oh you read my movie and book list :-)))) Am so pleased....just last Sunday I was telling my husband that maybe I should move them since no one reads them! Amra North London ee thaki...tomra kothai thako? :) eita abar is the way my grandmother (ma-er dike) cooks chicken curry. Besh hoy.